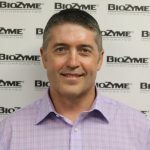 BioZyme® Inc. announces the hiring of Kevin Hayes, Saint Joseph, Mo., as its Director of Outreach. In his new role, he will lead global outreach in the form of employee and product development, customer support and logistics. “I have known Kevin since he was my student at Missouri Western State University. He was amazing then, and I am absolutely sure he will be amazing as our head of Outreach. He is experienced in both animal health and additives, two things that are core to BioZyme’s future success,” said Lisa Norton, BioZyme President and COO. Hayes has 25 years of global sales and marketing experience in the animal health and additive industries, having served in various positions at companies like Amlan International, Synbiotics, Boehringer Ingelheim, and most recently serving as director of sales and marketing for RitePack, Inc. He earned his Master of Business Administration from Benedictine College. “BioZyme is a company that has a growth trajectory that is phenomenal. The willingness of the CEO and president to continue to invest and desire to grow business, domestically and internationally, is exciting to me. The industry itself if second to none; the people and relationships are incredible,” Hayes said. He credits the company leadership for investing in high-performance sales, marketing and customer service teams, and will use his experiences in this position to continue to decrease the obstacles for customer interactions, ensuring a more positive experience for all. As BioZyme’s international business grows, Hayes will be able to contribute to that advancement as well. He understands the unique marketing needs of each country and will help customize the marketing to fit each country’s ideals. “Each market area is unique. Navigating the process from the time Volker (Altenbokum) and his team are looking for additional distribution points until the product hits the port – hopefully together we can shorten that time and commercialize quickly,” Hayes said. Hayes and his wife, Kay, have two teenage sons, Zack and Cooper. He is an avid golfer and enjoys traveling with his family, as well as spending time at home with family and friends. BioZyme is known for its supplement brands VitaFerm®, Sure Champ®, Vita Charge®, DuraFerm® and Vitalize®. The company also manufactures and markets Amaferm®, the key additive in all its supplements.